President Obiang Nguema Mbasogo of Equatorial Guinea met with Pope Francis at the Vatican last week and exchanged with Vatican officials the instruments of ratification of an agreement with the Holy See on relations between the Catholic Church and the Republic of Equatorial Guinea. The agreement was signed a year ago in the Basilica of Mongomo and enters into force with the exchange of instruments between the two parties. According to Vatican Radio, the agreement confirms the good bilateral relations between the two states, recognizes the legal personality of the church and its institutions, and covers canonical marriage, places of worship, educational institutions, and spiritual assistance to the Catholic faithful in hospitals and prisons. The United Nations estimates that Equatorial Guinea is 93% Christian and 87% Roman Catholic. “We were well received by the Holy Father, who is very interested in our country and has sent greetings and blessings to the people of the Republic of Equatorial Guinea,” said President Obiang at a press conference held after his return from Rome. After their meeting, President Obiang attended a mass at the tomb St. Peter. He returned to Equatorial Guinea shortly afterward on Sunday, October 27, and held a press conference to discuss the significance and success of the historic meeting. 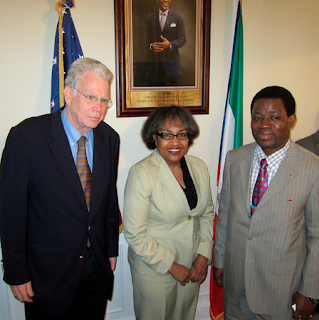 President Obiang Nguema Mbasogo is committed “to fully develop the country democratically, economically and socially” and the results so far are impressive, said Ruben Maye Nsue Mangue, Equatorial Guinea’s ambassador to the United States. 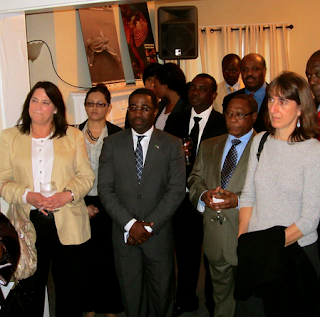 The ambassador made the remarks at a reception at the Equatorial Guinea Embassy in Washington to celebrate the 45th anniversary of the West African nation’s independence. During his welcome speech, Ambassador Nsue Mangue said that development in Equatorial Guinea is visible to everyone who has been able to visit the country. The government is heavily investing its oil resources in improving the standard of living of its citizens, which includes improving the education, infrastructure, health and other sectors. Equatorial Guinea has also made vast improvements in the health sector. Ambassador Nsue Mangue said that his government is aggressively pursuing electrification in Equatorial Guinea and that soon even the most remote villages will have electric power. He said that Equatorial Guinea’s government wishes to strengthen its ties with the United States and work with the United States for the benefit of both nations. U.S. Department of State representatives, including Deputy Assistant Secretary of State for African Affairs Cynthia Akuetteh, attended the event, as well as ambassadors, Marathon Oil representatives, and Equatorial Guinea’s permanent representative to the United Nations, Anatolio Ndong Mba. Ambassador Nsue Mangue recently presented his credentials to President Obama. 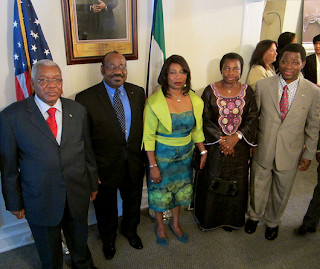 Previously, he was Equatorial Guinea’s ambassador to the African Union in Addis Ababa. 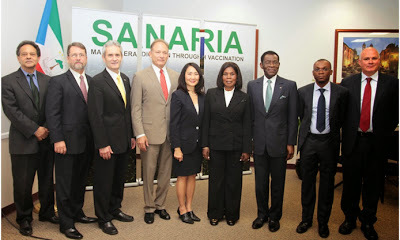 Equatorial Guinea’s President Obiang Nguema Mbasogo met with representatives of Sanaria Corporation in New York, last week to discuss progress on the upcoming malaria vaccine trial to take place in Equatorial Guinea. The president was in New York, to address the United Nations General Assembly (UNGA) and meet with several heads of government and heads of state. Equatorial Guinea is the second country in Africa to sponsor a malaria vaccine clinical trial. President Obiang reaffirmed the government's commitment to fight the disease, which is endemic in West and Central Africa. The West African nation has partnered with Sanaria, Ifakara Health Institute (IHI), Marathon Equatorial Guinea Production Limited (MEGPL), Noble Energy, and Medical Care Development International (MCDI) for this vaccine trial. Dr. Stephen Hoffman, President and founder of Sanaria, shared Sanaria’s mission with President Obiang and explained in detail the development of the vaccine trial. 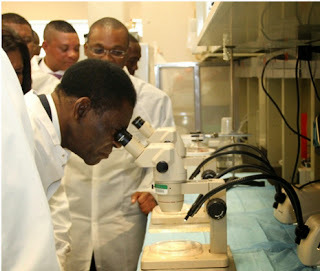 President Obiang and the Equatorial Guinea delegation visited Sanaria’s laboratory, where they saw a demonstration of the production of the malaria vaccine (PfSPz) and witnessed the dissection to remove the sporozoites that cause malaria and are used to make the vaccine. They also observed the storage and cold chain transportation of the vaccine. Marvin Rainsdon, MEGPL's general manager, expressed the research team’s appreciation for the support and commitment that the Ministry of Mines, Industry and Energy, the Ministry of Health and Social Security, Marathon, Noble Energy, AMPCO and EGLN have contributed to the research of the vaccine. Chris Schwabe, representing MCDI, an organization that manages the Malaria Control Program on the island of Bioko, shared the achievements the country has experienced in the last ten years, and explained that the vaccine trial’s ultimate goal is to eliminate malaria in the next five years. This milestone research is part of the government’s efforts to improve the country’s public health.